Here are some facts for you…. Smartphone penetration in India is expected to rise from 4 percent in 2009 to 15 percent in 2013. There are over 100 Million Internet subscribers in India, out of which about 60 million users actively use social media. Approximately 41 percent of Indians access content on the internet only through their cell phones. Approximately 77 percent of Indians have an average of 30 apps on their phones. This makes them the largest users of apps worldwide. 80 percent of Indians spend more than 15 minutes per day on social media every day. Are you now surprised why major Indian brands are in a race to bring out the best of their brands though apps? For youth brands of beverages, mobile service providers, FMCG items and cosmetics, it’s a great chance to launch their apps alongside commercials on air so that brand recall remains intact and interaction on the app increases. In India, brands like Axe Effect, Kurkure, KFC India and Philips have invested in launching whacky Facebook apps, a TOI feature reported. For instance, the Philips app allowed users to try out all the looks and beard styles that their brand mascot John Abraham flaunted in their commercial for male grooming products. This is in addition to other digital touch points such as a dedicated YouTube channel for checking out these different styles along with a Style Sutra booklet for the men’s grooming kit, Business Standard reported. On the other hand, KFC let users post their pictures that captured their expression on drinking Krushers Kafeccino, the drink that KFC wanted to promote through this app. The idea was to let users follow the story of the Krushers commercial which was on air at that time – youngsters clicking pictures of each other capturing their reactions on sipping the Krushers Kafeccino for the first time. Similarly, HUL India’s Axe Effect app allow users (especially the male category!) to stream live cricket scores, download fun and hot videos, wallpapers and interact with the AXE Angel, which is the central brand theme of most Axe Effect commercials. Tata Docomo launched Docomics in 2010, a comic viewer app for mobiles as well as a Facebook app called Songshare which allows users to publish their Call Me Tune (CMT) updates on their Facebook wall, recommend a song from the available songs list to their networks, copy and download songs for specific callers, amongst many other features. 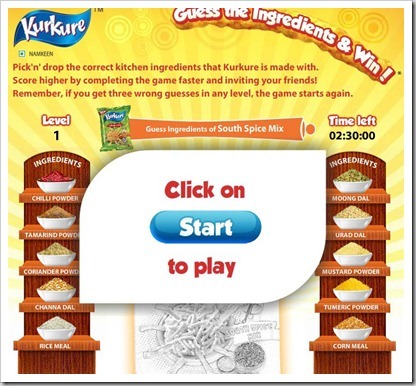 Kurkure’s "Ingredients of India" campaign with the "Badal Jaa" slogan invited users to try and find right mix of Kurkure by adding various ingredients. As users add the ingredients into the pack in the app, its colours change. "The value lies not in the number of users but the number of users into the engagement itself. If four minutes is spent on an app and 20,000 people are doing that, that’s 80,000 minutes. Four minutes per user is not small. Users aren’t watching a 20-second ad but are spending four minutes here"
Although most of these brands have thousands of users signing up for their apps, a Nielsen survey suggests that the measurable amount of user engagement that actually drives sales remains questionable. User engagement too, remains dubious at times, since it’s not just about a user signing up for a brand page or an app, it’s about how much the user interacts with the app, the number of times the app is downloaded because of the user’s recommendation to someone else and the number of times the app is shared, commented on and interacted with. Irrespective of this, as Indian brands learn to fully utilize the power of apps, we’re only going to see more and more of them jump on the apps bandwagon in India, due to such a burgeoning market. Here’s what a Nielsen survey suggests. Maybe brands can take a leaf or two from here! More than 53 percent users would like announcements on all discounts, sales and freebies. Interestingly, about 48 percent users would like the brands to share tips and tricks about how to use, maintain and upgrade their products or services. 1 in every 6 users wants their favourite brands to share updates regarding new products and services. About 42 percent of users want to take part in contests and interactive questioning and about 30 percent want to engage in productive and useful brand conversations. Around 41 percent would like brand pages and apps to resolve queries, concerns and complaints regarding the product or service. 5 Indian brands that top Facebook performance! most the Indian brands are using applications.if applications is succeed then ultimately the customers increased.the basic reason is Indians are using more percentage of applications newly developed.